You are here: Home / Let's Talk Cars / Cars carriers of lyme disease? Cars carriers of lyme disease? Due to the large acorn crops the rodent population has exploded this year. Gray squirrels are a good example. They can be seen testing their speed and agility against on coming traffic. Judging the carnage seen on the roads today, they’re not really good at it. The nest and related damage seen in the image to the left was not the result of squirrels. This damage was from a rodent that loves barns, wood sheds, houses and cars. This rodent is also a carrier of the disease known as Lyme. White-footed mice are carriers of serious and potentially fatal human diseases including hantavirus, Lyme Disease, and other diseases such as ehrlichiosis and babeosis. . Forty to 90 percent of white-footed mice carry Borrelia burgdorferi, the spirochete bacterium that causes Lyme disease, and they provide the first blood meals for black-legged ticks, also known as deer ticks, which can transmit the disease to humans. The Black-legged tick, which is often called a deer tick, is the one to watch out for. The nymph in the image to the left, shows beyond a doubt, how small the nymph Black-legged tick is. They are so small that they look like a freckle, making them easy to miss. 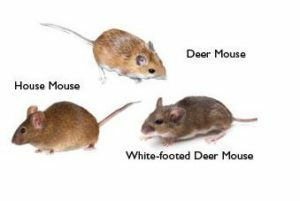 The white-footed, house and deer mouse are common in New Hampshire and they are the source/starting point of Lyme disease. Like the Gray squirrel, their population has exploded. How could ticks be in my car? 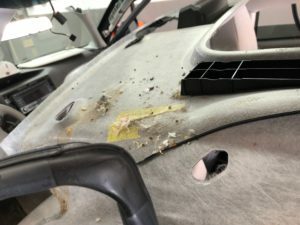 Mice finding their way inside a vehicle is common. How do they get in? 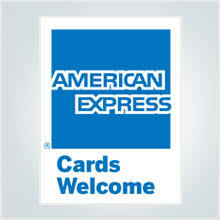 Frequently, the port of entry is the fresh air inlet for the A/C and heating system. In today’s cars the 1st line of defense, not much of a defense, against a rodent is the cabin filter. The cabin filter traps and prevents pollen and all types of dust in the air entering your car, it’s not really meant for rodent control. 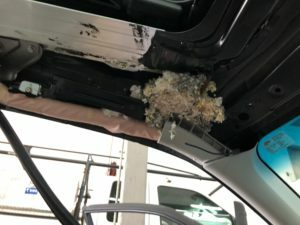 When rodents enter a vehicle they’ll often build a nest on top of the cabin filter and just live there.The filter is good at collecting their excrement aka pee and poop. As fresh air enters your car, it first goes through the mouse septic system, aka cabin filter, and you get to breathe it. 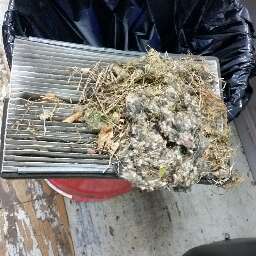 Sometimes a mouse and their family members live the last of their lives on the cabin filter. 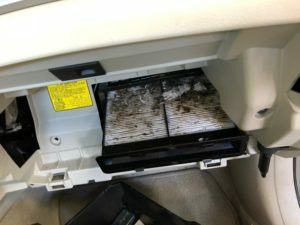 It is very common for us to find dead mice on cabin filters. Sometimes their family members become their next meal. Guess what the breed of mice we happen to find most often inside cars? Could a tick ride in with them? Click on image for a better view if you dare! When a host animal expires/dies, ticks and other bugs such as fleas and lice will leave their host. If that mouse or mice happen to expire in your car, ticks that might be carrying lyme disease and other insects such as lice, will abandon their host like rats from a sinking ship into your car. There’s another nasty little bugger that can arrive in you vehicle thanks to that dead mouse. That bug doesn’t have lyme, it’s a very ugly bug and how it arrives is straight out of a Sci Fi movie. This bug is the Bot Fly larvae, an adult Bot Fly resembles a bumble bee. The Bot Fly larvae are commonly found you guessed it, in mice. When that mouse dies, like all the other bugs, the Bot Fly larvae leave their host as well. Can it get any grosser? Yes it can, once mice chew through a cabin filter, which happens often, they start building nests in all kinds of places. It is very easy for them to crawl up a car’s A-pillar and get into the headliner. The headliner is a great place to settle in and start a family. Most of the time the nests end up just over the passenger and driver’s side doors. 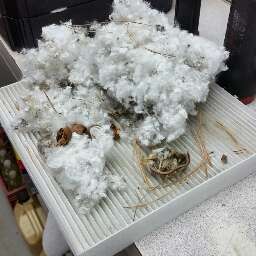 We have found many airbags that have been chewed and contaminated with mouse waste (yup poop & pee). 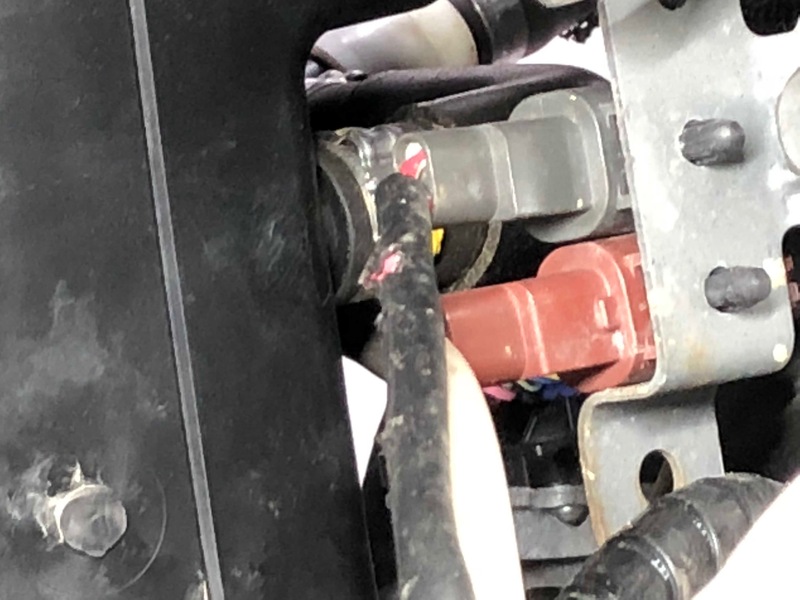 When this is found the headliner and the side curtain air bags have to be replaced. The air bag system in today’s vehicles is a very sophisticated safety system. Damage by mice can compromise this technology that could result in a system that will not operate as designed. 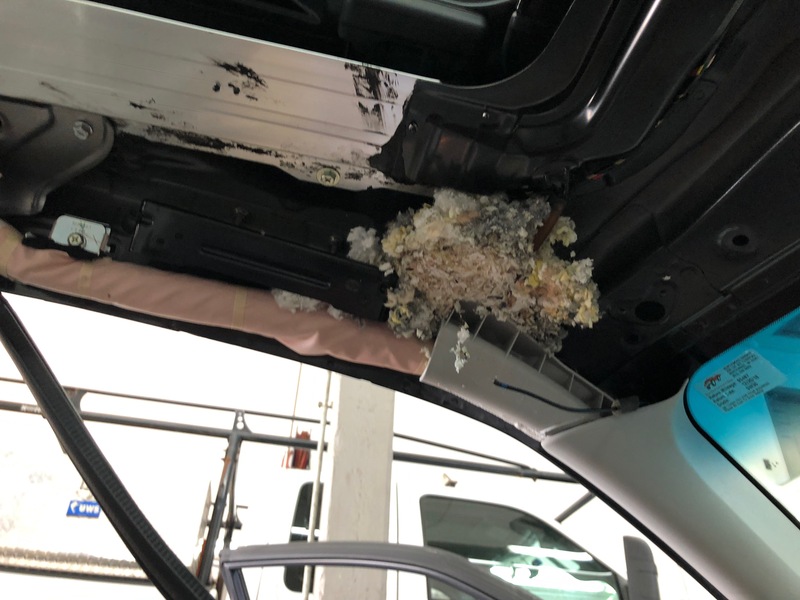 The possibility is real that a rodent damaged air bag system can become more of a danger than a safety device to you and your family. That’s one of the reasons insurance companies REQUIRE replacement of the air bags when rodent damage is found. 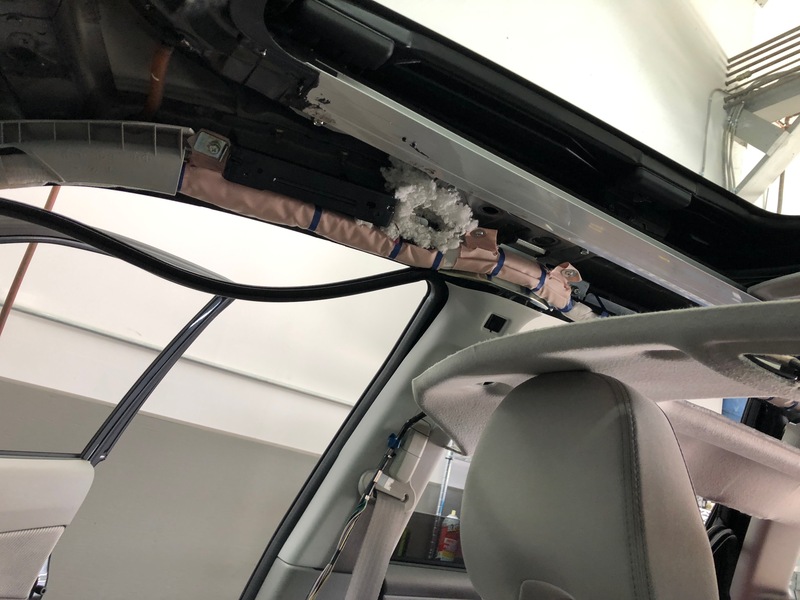 The Subaru in the image needed a replacement headliner, both side curtain air bags, part of a wiring harness along with disinfecting before the owner got their car back. Why do mice gravitate to cars? There are several reasons for this and if you think about it, it makes sense. 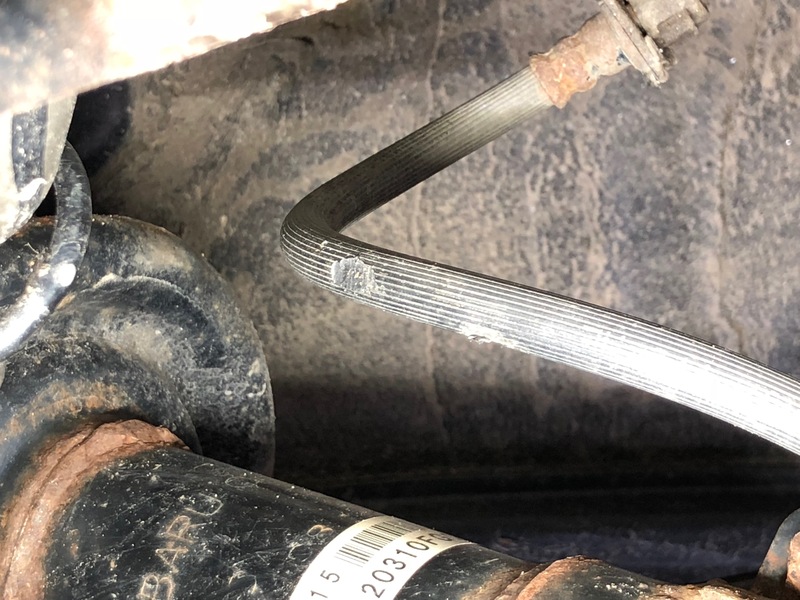 Cars are often warm, they’re very protective with all kinds of small cavities to keep mice safe from predators, there is plenty of stuff to chew on and the owners often have food in their car. We had a customer come into the shop complaining about a noise from their headliner; sounded like small pebbles rolling around. When you tapped on the liner you could hear a distinct rattle of a bunch of something. When we removed the headliner a whole lot, (I mean a lot!) of candy corn fell out along with some mouse stuff. The owner of this car had an affection, and there, in the center console in the cup holder, was a cup full of candy corn. That’s right, she enjoyed her candy corn and didn’t know the mice enjoyed it too! Here’s the gag me part. She just about always drove with and continually refilled her supply of candy corn. The mice had to have been climbing in and out of the cup to get their supply. Don’t tell me they didn’t have any accidents while they were grabbing their store of food in the candy corn cup. People have tried drier sheets, mothballs, peppermint and several other items to detour rodents, we’ve found their effectiveness to be limited. Be proactive; Have your vehicle’s cabin filter inspected with every oil change. If you happen to get in your vehicle and think there’s an odd smell have it checked out immediately. Never leave food in your vehicle! We even found a dead mouse in a coffee cup once! If you have children you likely have McDonald french fries on the floor and other food debris falling behind the seat. Full seat covers help stop that. Clean out car seats regularly as well. Never put a bait block or any other rodent poison inside your vehicle. Avoid parking near stone walls, brush or wood piles. If your garage has a rodent problem have it addressed and don’t park in the garage until it has been. The point of this article was not to scare you, it’s to inform you of possible dangers that rodents can bring into your car and life. If your vehicle has been invaded by rodents you should know that we work directly with insurance companies. We’ll perform the necessary work and repairs to clean, disinfect and repair rodent damage done to your vehicle. 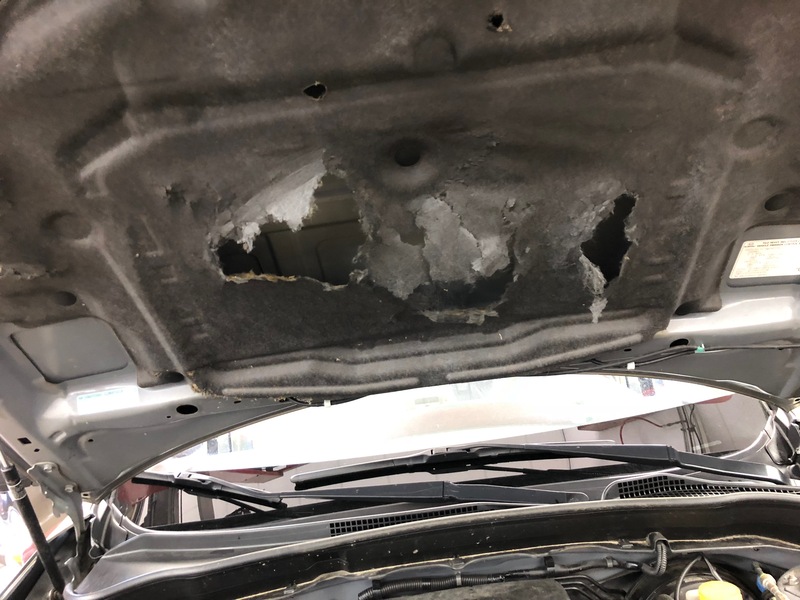 This year (2018) we have performed rodent repairs on 9 vehicles, 11 if you count the 2 vehicles that the insurance companies totaled due to rodent damage.